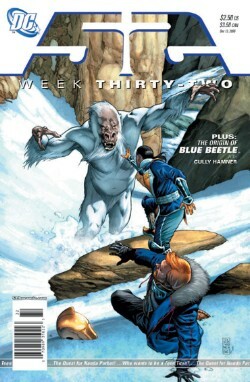 "Seven Days in Nanda Parbat"
Back-up Story: "The Origin of Blue Beetle"
Day 1: Ralph Dibny and the Dr. Fate helmet are a lot closer to Nanda Parbat than they realize when they're attacked by an abominable Yeti. They're saved and brought into Nanda Parbat by the Accomplished Perfect Physician, a member of China's Great Ten meta-team. Day 2: In San Francisco at Titans Tower, Raven and Beast Boy are recruiting new Titans. Steel had the idea to have the Titans recruit at least one of Lex Luthor's bio-engineered "Everyman Project" heroes onto the team. Kid Devil is there as a human with a gimmick (One Year Later, he's a genuine hellion and we get an idea as to what will cause the change when Pulsar tells Kid Devil he'll put in a good word with him with the Everyman Project). Black Adam's brother-in-law, Osiris, flies in with his Crocodile friend Sobek. Captain Marvel, Jr. tells Osiris to leave because he's scaring people because of his affiliation with the murdering Black Adam. Osiris says he just wants a chance to make the world a better place. Captain Marvel, Jr. is convinced. Raven empathically scans Osiris and picks up only one emotion from him: hope. Day 3: The lost-in-space heroes all decide to make a first and possibly last stand against the marauding alien invaders. Day 4: Dibny wakes up. He'd been unconscious for three days. He tells the monk who is caring for him that he wants to seek an audience with Rama Kushna. The Accomplished Perfect Physician tells Ralph that the Yeti that attacked him is really a reserve member of the Great Ten. A charm found by Ralph apparently inhibits the Yeti's rage. Ralph is told Rama Kushna can't see him so the Accomplished Perfect Physician takes Ralph with him to recover the Yeti. Day 5: After Ralph ensnares the Yeti with the electronic charm, the monk reappears and tells him that Rama Kushna will see him. Day 6: Dibny meets Rama Kushna. He tells Rama that he wants to be with his deceased wife Sue again. Rama tells Dibny she will show him how. Day 7: Dibny tells the Accomplished Perfect Physician that Rama told him "The End is Already Written." The Accomplished Perfect Physician asks who wrote it. Ralph tells him that the writer is Dibny himself and the end was written in May at the end of the Crisis at the Ambassador Hotel (where "52" picked up Dibny's story as he prepared to kill himself). Dibny and the Fate helmet leave Nanda Parbat. Jaime Reyes is El Paso's defender, the Blue Beetle, this time with the mystical power-giving scarab. Story - 2: An issue full of unnecessary exposition. How boring. Some of this seems like a fill-in-the-blanks on things that we know will happen "One Year Later", now just five months and change later (like Kid Devil). Most of it just seems like unrelated mish-mash that will be long forgotten by most readers by the time of the ultimate pay-off around, say, issue 52. Art - 2: The art is half-way decent when the artist is drawing close-ups and foreground images. However, his background characters have no detail - and it feels like laziness, not style. Half the time the Accomplished Perfect Physician doesn't look Chinese. The kid who turned into the Yeti looks exactly like Captain Marvel, Jr., who looks exactly like Osiris. The artist really phoned this one in. An artist like Phil Jimenez could have had a field day with the Titans try-outs. A miss on the story and a miss on the art - at least the issue's consistent. Backup Story - 1: So who cares? Not even DC, it seems. The new Beetle's had his own tepid comic book for the better part of 2006 and yet only one issue (number seven) is listed as an essential storyline in the new Beetle's Who's Who write-up. Art - 2: It all looks very "Batman Beyond" to me. Come to think of it, young kid back-doors his way into super-heroing when he finds his predecessor's outfit/scarab. There are no original ideas - that's what the art says to me. Cover Art - 3: Cool Yeti. The Accomplished Perfect Physician looks a little like Nightwing from the back. It's too bad that what's inside falls so flat.